The Office of Local Government has engaged Greenhounds to manage the greyhound behavioural assessor application process, including the authorisation of suitably qualified applicants. Degree in Veterinary Science and current registration under the Veterinary Practice Act 2003. The Certificate IV in Companion Animal Services is widely recognised as the minimum standard qualification for people working in a companion animal organisation and particularly in an animal behaviour related area. Some applicants who do not hold a Certificate IV in Companion Animal Services may have otherwise obtained an appropriate level of skill, knowledge and experience through related work or study. These applicants may apply to an registered training organisation for the Certificate IV in Companion Animal Services qualification through the organisation’s recognised prior learning process. Documentary evidence of relevant experience is generally required to support such an application. An approved assessor would be required to offer individual assessments of their pet greyhounds in order for them gain a muzzling exemption. Before applying to become an approved assessor, a person will need to be prepared to vonform to the guidelines for Approved Assessors as set down by the Office of Local Government (available here). Purchase required equipment such as a microchip scanner. If necessary, Greenhounds are happy to discuss any of these expectations with you further before you proceed to the next step. If you are suitably qualified and wish to apply to become an approved Greenhound assessor, please follow the process below. Prospective greyhound behavioural assessor applicants must contact Greenhounds to register their interest by phone or click here to email us. Applicants must then complete the required application form and attach evidence that they meet the requirements. Suitably qualified applicants must complete a greyhound behavioural assessment training short course ACMACR403A - Identify and respond to animal behaviour – Greyhound. This one day course is a nationally recognised competency that has been specially tailored to assist in interpreting greyhound body language and behaviour. This will give the assessor the necessary knowledge to enable them to undertake assessments of greyhounds for muzzling exemptions for the purpose of granting a Greenhound collar. 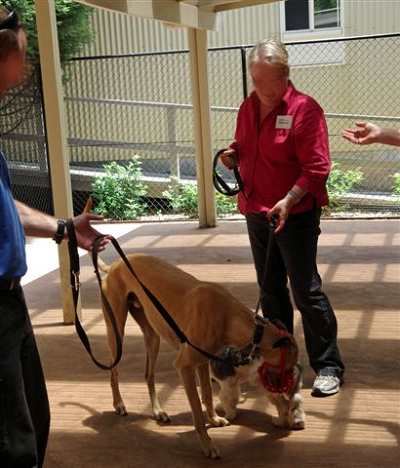 The course is delivered through TAFE NSW at the Richmond campus by qualified Greenhound staff. The course covers the Greyhound Adoption Programme National Temperament Test (GAPNTT) which is to be used for all assessments. View the course content here. Contact Greenhounds for details and enrolments by clicking here. When a suitably qualified applicant has successfully completed the one day course, Greenhounds will notify them of their authorisation as a greyhound behavioural assessor. Greenhounds will maintain a database of authorised assessors and their contact details and fees will be publicly available on this website.